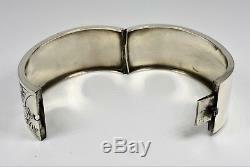 Antique Victorian Solid Silver Aesthetic Hinged Bracelet, c1890. 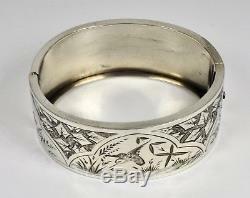 Antique Victorian solid silver aesthetic hinged bracelet, c1890. 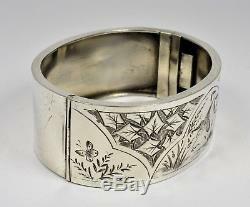 Solid silver hinged bracelet from the aesthetic movement period. Beautifully hand chasing to the front panel of the bracelet. 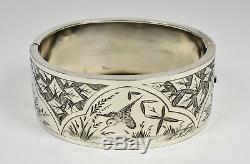 Hand chased decorated with a kingfisher hunting on a river, finished with butterflies & a floral pattern. A wonderful addition to any collection. 1885 The first legal cremation in London. 1890 Vincent Van Gogh died. 1895 The FA cup was stolen from a shop window in Birmingham, it was never recovered. Excellent condition for it's age with light surface marks that are consistent with genuine age, use & polishing. 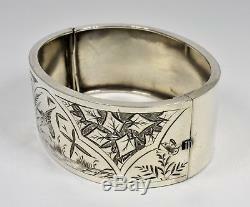 The item "Antique Victorian Solid Silver Aesthetic Hinged Bracelet, c1890" is in sale since Sunday, October 21, 2018. 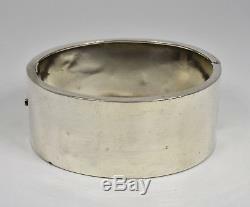 This item is in the category "Jewellery & Watches\Vintage & Antique Jewellery\Vintage Fine Jewellery\Victorian (1837-1901)".lake" and is located in Bristol. This item can be shipped to North, South, or Latin America, all countries in Europe, all countries in continental Asia, Australia.